The best way to prepare for the RDN exam. Welcome to the Academy of Nutrition and Dietetics eatrightPREP for the RDN Exam course. This site has been designed for anyone preparing to take the registration exam for registered dietitian nutritionists. This exciting tool can be used to strengthen your exam readiness as you study for the RDN exam and serve as a complement to your preparation for the Registration Examination for Dietitians. Take the next step in your career path by preparing for the registration exam with the Academy’s comprehensive and convenient eatrightPREP for the RDN Exam. *Your access begins the day of purchase. Access is for a single person only and is not to be shared. *Subscribers who wish to extend their access may purchase a 1-month subscription extension for $49.99. Contact us for details. No need to take valuable internship time to send interns off-site for review course. eatrightPREP can be accessed 24/7 anywhere where internet is available. Affordable price: take advantage of eatrightPREP’s multiple-license discount (see below for more details)! 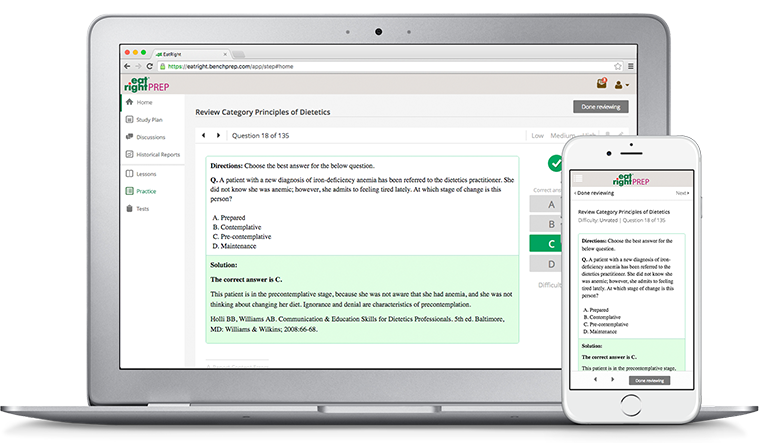 Provide interns or students with real-life exam simulation to help prepare for actual test day experience. eatrightPREP’s practice exam technology simulates the RDN exam experience, better preparing exam candidates by familiarizing them with the testing environment. Help your interns prepare more efficiently through performance metrics for based on each student’s individual performance. These reports help students to target strengths and weaknesses before exam day, improving their overall knowledge and likelihood of passing the RDN exam. Partner with students to review historical reports of their progress through the eatrightPREP course to monitor that work has been completed on time and students aren’t using less-effective exam strategies (like cramming) to prepare for the RDN exam. EatrightPRE’s practice exams comply with CDR’s new Exam Specifications for 2017. Want to learn more? Click here to request a complimentary educator preview! Program pricing is available for your classroom or nutrition and dietetic internship program at the rates listed below. For additional information about multi-user discounts or to place an order, click here. See the FAQs for more information on how to use eatrightPREP for the RDN Exam in your dietetic internship program or class curriculum. Can I use the eatrightPREP for the RDN Exam course to study for the Registration Examination for Dietitians? Yes. The Academy’s eatrightPREP for the RDN Exam is modeled after the official computerized Registration Examination for Dietitians given by the Commission on Dietetic Registration (CDR). With purchase of the full course, you will attempt 3 full-length practice exams covering each of the 4 domains that are covered in the RD exam. eatrightPREP for the RDN exam has been updated to reflect the new 2017 exam specifications from CDR. You can take the practice exams as many times as you’d like in a 90-day subscription period. Is the eatrightPREP for the RDN Exam approved by the Academy of Nutritionand Dietetics? Yes. The Academy endorses eatrightPREP for the RDN Exam. Who creates questions for eatrightPREP for the RDN Exam? Questions are created by current RDNs. All questions are reviewed by the editor in chief, Lauri Y. Wright, PhD, RD, past chair of the Dietetic Educators of Practitioners (DEP) Dietetic Practice Group. What topics are covered in the eatrightPREP for the RDN Exam course? Are there exam prep resources within the eatrightPREP for the RDN Exam course? There are links to multiple Journal of the Academy of Nutrition and Dietetics articles, Academy SOP/SOPP statements, Academy position papers, Academy Practice Papers, the Academy Code of Ethics, and links to the Nutrition Care Manual and the Nutrition Care Process. We strongly recommend you review these prior to taking the practice exams and use these materials during your preparation for the registration exam. How often can I take the practice tests? You have access to 3 full-length practice exams. You can reset & retake each one as many times as you would like within your 90-day subscription period. How will I know if I’m improving? You have access to complete performance statistics for each practice exam and all the practice questions in the study plan. Your practice tests will be scored each time you take one. You can view the historical reports of each exam you’ve taken to track your improvement over time. You can also see how well you’re doing in each question category (ex: foodservice systems). eatrightPREP for the RDN exam will help you identify your strengths and weaknesses in the exam prep material. Students have used this feature to narrow down their weaker areas and spend more time reviewing these content areas before exam day. Is there tech support available for the eatrightPREP for the RDN Exam? Yes. For technical support issues contact our course provider, BenchPrep. How can eatrightPREP for the RDN Exam be used in your dietetic internship program or class curriculum? Assign interns one of 25 practice question sets (40 questions each) to complete as homework assignments. View historical reports of your students’ course engagement, which log when work was completed. Ask students to create an action plan for studying for the RDN exam based on their performance in the course. eatrightPREP for the RDN Exam will identify their strongest and weakest exam categories, so students can begin to plan how they will review material in their weaker areas. Challenge students to take a complete practice exam! Or all three during a final semester! Have students submit their incorrectly answered questions to the program director to improve internship or course experiences for next year’s cohort. Encourage students to complete the eatrightPREP for the RDN Exam course as graduation nears. After taking an initial practice test, they will complete practice questions to improve their knowledge. At the course’s mid-point, another practice exam is provided. A final set of practice questions will be reviewed, and then a final exam! Students love to watch how their knowledge progresses over time. Challenge interns to start a discussion on eatrightPREP for the RDN Exam to create a study group for their internship program! Refunds are handled on a case-by-case basis. Customers wishing to withdraw from the course and receive a refund should send an e-mail request to eatrightprep@eatright.org. Our staff will review the student’s log-in to determine how much of the course has been used and then decide how much can be refunded. May I copy information from the eatrightPREP for the RDN course? The content of eatrightPREP for the RDN exam is copyrighted material. No part of the materials in the review course may be copied, downloaded, reproduced, stored, disseminated, transferred, or used in any form by any means without prior consent of the Academy of Nutrition and Dietetics. May I share my eatrightPREP for the RDN exam with other individuals? Access is for a single person only and is not to be shared under any circumstances.